SPSS one-sample t-test tests if the mean of a single metric variable is equal to some hypothesized population value. The figure illustrates the basic idea. A scientist from Greenpeace believes that herrings in the North Sea don't grow as large as they used to. It's well known that - on average - herrings should weigh 400 grams. The scientist catches and weighs 40 herrings, resulting in herrings.sav. 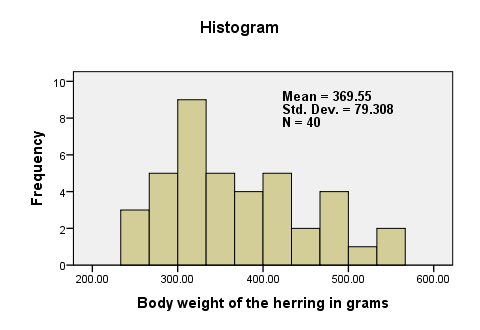 Can we conclude from these data that the average herring weighs less than 400 grams? We'll open the data by running the syntax below. cd 'd:downloaded'. /*or wherever data file is located. Before we run any statistical tests, we always first want to have a basic idea of what the data look like. A fast way for doing so is taking a look at the histogram for body_weight. If we generate it by using FREQUENCIES, we'll get some helpful summary statistics in our chart as well.The required syntax is so simple that we won't bother about clicking through the menu here. We added /FORMAT NOTABLE to the command in order to suppress the actual frequency table; right now, we just want a histogram and some summary statistics. Assumption 1 is beyond the scope of this tutorial. We assume it's been met by the data. The normality assumption not holding doesn't really affect the results for reasonable sample sizes (say, N > 30). The screenshot walks you through running an SPSS one-sample t-test. Clicking Paste results in the syntax below. We'll first turn our attention to the One-Sample Statistics table. We already saw most of these statistics in our histogram but this table comes in a handier format for reporting these results. The actual t-test results are found in the One-Sample Test table. - The t value and its degrees of freedom (df) are not immediately interesting but we'll need them for reporting later on. The p value, denoted by “Sig. (2-tailed)” is .02; if the population mean is exactly 400 grams, then there's only a 2% chance of finding the result we did. We usually reject the null hypothesis if p < .05. We thus conclude that herrings do not weight 400 grams (but probably less than that). It's important to notice that the p value of .02 is 2-tailed. This means that the p value consists of a 1% chance for finding a difference < -30 grams and another 1% chance for finding a difference > 30 grams. The Mean Difference is simply the sample mean minus the hypothesized mean (369.55 - 400 = -30.45). We could have calculated it ourselves from previously discussed results. Next tutorial: Z-Scores – What and Why? Thanks for the compliments! In what format are your data now? Ranked data often result in ordinal variables which can be analyzed with nonparametric tests. I found your learning materials and the way you present them are very remarkable. And thank you very much for that. You are a life save! Saying that let me add one question. How could I enter and analyze ranked data collected through survey using SPSS.